The day I learned that you can easily make sweet potatoes in the microwave was a good day! I simply wrap a sweet potato in saran wrap and microwave it for four to five minutes. A perfect sweet potato every time! I can’t believe I used to wait foreeever for them to bake in the oven. 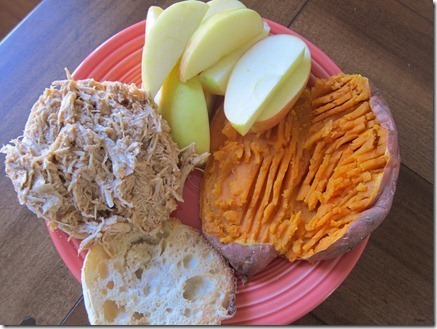 Today’s microwaved sweet potato was enjoyed with a BBQ pulled chicken sandwich served on a toasted English muffin with a side of apple slices. I was really hoping for some peanut butter to dip the apples in on the side, but we’re all out. The horror! Leftovers always make lunch easy breezy. It was the perfect lunch to break up a busy day of writing. The words are flowin’ easily today for my freelance projects, which feels great! I really enjoyed reading your comments about your favorite way to make overnight oats on this morning’s post! I can’t wait to play around in the kitchen! Thanks for your feedback and ideas, as always. I still love sweet potato fries the most but you can make them on the stove in about 20 minutes! I have never been able to successfully microwave a sweet potato. The skin is always tough and gross and some part of the potato just does not cook. I’ve never used saran wrap before though. I always steam them which seems to be how no one else makes them, haha. Mmm now I want sweet potato fries! I haven’t been eating overnight oats lately as the weather has been cooler, but now I’m excited to experiment! Hi Julie. You can even save yourself the plastic wrap step. I just pierce the s.p. with a knife in numerous spots throughout the s.p., put directly on the turntable or a plate, and microwave for about 8-10 min. Voila! Same! I’d be a little worried about all the chemicals and whatnot in saran wrap! I read that you can make potatoes in the slow cooker by wrapping in aluminum foil and cooking either on high for 3-4 hours, or low 7-8 hours. I want to try this one day on low and have a fully cooked side dish ready to go when I get home from work. Would take very little prep in the morning too compared to some slow cooker dishes, that sometimes would just be easier to make on the stove! Why would you do this in the slow cooker for hours on end using electricity when you can do in MINUTES in the microwave?!!?? It’s just a suggestion 🙂 some people prefer the texture of a baked potato over one microwaved. Since it takes an hour to bake a potato, someone who gets home from work late may not have that kind of time. The microwave works just fine though in a pinch! You can also wrap them in a damp paper towel after piercing with a fork. It usually takes about 8-10 minutes depending on the size of the sweet potato! I might have to get creative and try some of these overnight oat additions! Yum! I love micro-sweet potatoes!!!! Here, they’re not orange, they’re purple on the outside and white on the inside, but they taste the same! you can also just stab it with a fork all over and throw it in the microwave, no wrapping needed! I usually wrap it in a paper towel and that works too. waiting for the oven is torturous when you’re short on time! Ohh I need to start incorporating sweet potatoes into my diet! I see them all the time on the blogs and now I need to give them a try too! Those overnight oat suggestions are really interesting! I like the idea of using chocolate almond milk too– yum! others already mentioned, but skip the saran incase it’s true that it leaches chemicals! 🙂 (I grew up my whole life covering microwaved things in saran, but I guess better late than never to start new habits? Haha!) I’ve heard to wrap the sweet potato (after piercing it) in a damp paper towel, and I’ve also just done it on a plate uncovered – same results, in my opinion. Yum! 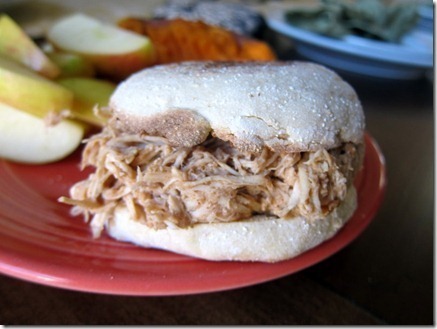 Try it with baked beans on top, so good! Oh, I love microwaving my sweet potatoes! I do it daily! They def taste more caramely in the oven, but nuking them is great for lunch during the work day! I looove making sweet potatoes in the microwave, but I omit the saran! When I cook them I always microwave sweet potatoes, and I can’t taste the difference between the microwaved and oven baked ones. My favorite way to eat them is with lots of cinnamon and a little bit of honey…so good! Julie, you CANNOT be serious. You didnt know that you could microwave potatoes? You do know that pretty much ANYTHING can be cooked in the microwave right???? EVEN potatoes. i figured you could – that’s why i googled it to find out exactly how to do it so i didn’t blow it up! I honestly thought the title of this post was a joke…nope. Lol Julie, come on. You just poke the dang potato, wrap it in something (or don’t, works just fine that way too), and cook it in the microwave. In the nicest way possible, since I’m a long-time PBF fan, I cannot believe this is the topic of an entire blog post. sorry, brittany – i didn’t think it was the topic of the whole post – just a quippy little part of it! i thought highlighting people’s ideas for overnight oats was the majority of the post, but i guess i should’ve considered that when titling the post. i think your reaction was actually fine and edited the title of the post to reflect the content i was hoping would get the most attention – the overnight oats ideas! to make things worse, i microwave regular potatoes all the time but NEVER (really, not once, ever) thought to do a sweet potato in there. in fact, when i saw it in your post i was like “how cool, i’ll have to try that!” and got really excited that sweet potatoes suddenly became a quick food option instead of the regular take forever in the oven process. i kinda feel silly now with some folks pointing out the obvious, but at least you know you’re not alone!!! Would you add the protein powder the night before or that morning?! I am so passionate about my overnight oats! I actually eat them EVERYDAY for lunch! I like to pile them high with tons of berries – Yum! Can’t wait to try the sweet potato – love the ideas of baked beans, cinnamon and honey! Where do you buy the protein powder to use in smoothies and overnight oats? You can microwave saran wrap? That doesn’t turn into a melty plasticy pile of goo? it has held up for me so far! I usually only make a baked potato in the microwave! I just poke it with a fork or a knife a bunch of times and it comes out great. I can’t even fathom the idea of cold oats – so I’ll pass on this one! I only like em cause they’re so nice and hot on a cold day! If it makes you feel any better at all, this post is literally the FIRST time I have ever heard of microwaving a potato! I am SO excited to try it tonight! Thanks for sharing the tip! Also, I use the Quaker Weight Control Instant Oatmeal Flavors for my overnight oats. Works just as well and adds some flavor with only 1g of added sugar, and extra fiber and protein! My favorite is the cinnamon! I love microwaving sweet potatoes! So easy! and I totally bookmarked this! I have to leave at about 7 for class this semester so I think overnight oats will come in very handy! I love sweet potatoes! I’m going to try one in the microwave tomorrow fo’ sho! I always make sweet potatoes in the microwave when I’m short on time – it’s the best! I LOVE making sweet potatoes in the microwave! But you don’t even have to use a wrap around it..just poke several holes in the potato with a fork and place directly in the microwave! ALSO, I just learned how to microwave corn..so so easy! All you do is place the entire stalk in the microwave..husk and all and microwave on high for two minutes. When done, peel and eat! It’s PERFECTLY cooked everytime! To top off my oatmeal, I almost always mix cheesecake jello powder to vanilla or plain yogurt. It adds the perfect sweetness to my oatmeal combination. I’ve never tried it, but I think mixing some powder to the overnight oats would work really well. My favorite oatmeal lately has been pumpkin cheesecake oatmeal, where I mix pumpkin and oats, add some greek yogurt with the jello powder mixed in, and top it with apple slices and some almond butter. It is soooo good! I think i am going to go prep myself some overnight oats for the morning! Such fabulous overnight oats ideas! I cannot wait to try these variations using your recipe for overnight oats. I think it will be much better than before! Great idea! I just discovered you can make overnight oats successfully with Coach’s Oats. I mixed it w/ blueberry CHO yogurt, coconut milk, chopped walnuts, and shredded coconut. It was SO good! Great pre hiking fuel. Love the idea of using PB on the bowl… gr8 idea! Yay..now I can make my sweet potatos in the microwave too! 😀 Thanks for sharing! Thank you for the honorable mention on my oats! lol..if I had known, I would have mentioned that I like to put walnuts, rasins and cinnamon on it too. But I will give your version a try, I just never thought of eating them cold, but my boyfriend says that’s the way he grew up eating them. Oh, and I never thought of wrapping my sweet potatoe in wet papertowel, that would probably help with the skin. It was only a year ago that I discovered you could nuke em, I don’t know why, because I have done normal potatoes quite often in the microwave. Pumpkin sounds like a great addition! I accidently bought the quick oats one time and kept making my ONO with those- which I ended up liking the texture better! I would like to use the quick oats, but once heard they don’t have the same nutritional value. Can any one confirm? They are just cut smaller I thought? I love overnight oats! Next on the list for me is trying it with steel cut oats. I love their texture! I love overnight oats..I use Quaker oats, dannon light and fit banana flavored yogurt, skim milk, & pb..they are so good I love the texture and something about cold breakfast fuels me better than a warm one. I was thinking of adding protein powder would you suggest adding this in the a.m. or the night before? i think either way would be good! i’ve done both!